Not just an epitaph for Y-STR and I'd dare say for the 'molecular clock' hypothesis in general (at least for the insulting certainty and supposed scientific value that some people attributed to them too often). More interesting for me anyhow is that the authors find that all the claims by Balaresque and co. about greater Eastern diversity of R1b1a2 are faulty. The paper totally vindicates what I have been saying, specially in the last year and specially on Balaresque's outrageously bad science. Someone wrote to me saying that "It finally drives a stake to the heart of the Balaresque et al(2009) theory of Neolithic origin". And a well deserved, even if belated stake, I dare say. Don't get your hopes up, even with the most linear markers, the age is still 8.3ky BP, a long way from your "Magdalenians". The eastern origin as unassailable on phylogenetic grounds, as Western Europe is pretty much limited to a twig of the R world, and all the basal action is going on in the East. We'll know much more through a combination of full-Y sequencing and ancient DNA. So essentially lineages go on a statistical "random walk", and one lineage can end up looking similar, and another different from a common founder lineage, in a non-linear fashion. So extracting the correct aging is fraught with difficulty. As the 1,000 Genomes project and others have shown recently, there are many SNPs out there, and many more to be discovered, which are invaluable, as they do follow a linear pattern, and exact branching of lineages can be determined by their use. It's not "my hopes" or anything but the truth what matters here: the structure of R1b1a2 is simply not consistent with a "Neolithic format" expansion, which would require (at least) two different flows (and hence subclades) along the Mediterranean and through Central Europe respectively. Instead it is consistent not with Magdalenians (that'd be R1b1a1a1b (P312/S116)) but with the Aurignacoid expansion c. 40 Ka ago. Morelli's "clock" result was anyhow of 25-80 Ka ago, consistent with this I am saying. He used the same method's as Myres, say the authors of this paper, but with a different (smaller) dataset, focused on Sardinia and Turkey only. "We'll know much more through a combination of full-Y sequencing and ancient DNA". 1. Locating the SNPs that define the "Anatolian" branch, which is clearly looking not anymore as "ancestral" but as a parallel lineage to R1b1a2a1. 2. Researching the SNP and STR diversity within all that R1b1a1a1b*, concentrated in SW Europe. Trying to find at least the major sublineages under the "asterisk" mask. 3. Mapping Europe (etc.) properly. The greatest shortcoming I can find in this paper is the lack of sampling of most of the Franco-Cantabrian region (SW France specially). This should be a basic in order to understand what role, if any, played in the scatter of R1b1a1a1b (most likely not in upstream steps). 4. Of course, try to obtain some Y-DNA from several, diverse, Paleolithic European remains (unsure if this is possible). Morelli's clock is based on the evolutionary mutation rate and is hence wrong. The demise of the evolutionary mutation rate made ages younger; the recognition of non-linearity in Y-STRs makes ages older. The two factors, however, do not necessarily balance each other out. As for "Aurignacian" 40ky ago expansion, that belongs in the realm of science fiction. The 'evolutionary' rate is NOT 'wrong' just because you say so. If one is going to attempt to reconstruct the past, one has to understand how lineages behave statistically on long periods. It is anyhow an approximation but it's likely to be much better than the 'massively successful single lineage' rate (how do you call it when only one lineage manages to reproduce and all the rest are magically vanishing? 'Pedigree rate'?) which requires that all but a few become true celibate monks (i.e. it ignores reality altogether). Research on the use of both rates on mtDNA concluded that the 'pedigree' rate cannot be applied just like that for dates before 5000 years ago. There are other issues, like the calibration based on too recent estimates for the Pan-Homo divergence. In general all dates are underestimated, with maybe a few lucky exceptions (all 'evolutionary' of course). "As for "Aurignacian" 40ky ago expansion, that belongs in the realm of science fiction". As far as I understand it, it's most likely the case. We would have MNOPS expanding maybe c. 70 Ka ago in SE Asia, P soon after in Bengal, R then in NW India and R1b would be in SW Asia c. 50 Ka, while some of its Q "cousins" would be reaching to Altai simultaneously. You have just proclaimed the death of the 'molecular clock' in this entry, helping Population Genetics to break free from a cumbersome burden of pseudoscientific faith, do not try to resuscitate it, please. The 'evolutionary' rate is NOT 'wrong' just because you say so. It's not wrong because I "say so". I have argued at length and in great detail why it is wrong. If you want, you can argue back, based on MATH, and not based on your irrational desires to make Basques patrilineal descendants of the Aurignacians. Maju is simply trying to make the Aurignacians the forfathers of the various lines of Cro-Magnons. There's is no way you can disprove of that - which is why Maju is rigth about keeping 'pseudoscientific faiths' out of the debate. Although the Magdalenian scenario is (still) not possible to prove or disprove - his scenario is clearly possible. Especially if we consider the papers repport on the inconsistencies of our 'genic clockwork'. I don't need to disprove anything. It is up to those who hold an opinion to present the evidence for it. When an Aurignacian-era modern human from Europe tests R-M269, or when R-M269 is dated to 40ky by some technique, I'll consider Maju's theory. At the moment, R-M269 is dated well after the Aurignacian with either the best Y-STRs or with Y-SNPs, and it has not been found in any European before the Bronze Age. So, I don't see the need to entertain Maju's outlandish Aurignacian theory. "A major Y-chromosome haplogroup R1b Holocene era founder effect in Central and Western Europe"
I was only adressing the difference of 'entertaining his theory' vs. 'dismissing it'. Of course, I don't expect you to do either/or...! A more recent origin for R-M269 than the Neolithic is still possible. But researchers point out that after the advent of agriculture, populations in Europe exploded, meaning that it would have been more difficult for incoming migrants to displace local people. If M269 came to Europe after the Neolithic then why is it more common in the West than in the East? If M269 were such a latecomer then western Europe should have had a large population of non-M269 humans. What happened to them? If they were exterminated by incoming M269's then how was this accomplished with such primitive technology? I think that it is more likely that M269's in Europe were ancient hunter-gatherers who were replaced by Middle Eastern farmers - most likely J's - in southeastern Europe. "[W]hy is it [R-M269] more common in the West than in the East?" "... or when R-M269 is dated to 40ky by some technique, I'll consider Maju's theory". Morelli did (and I already mentioned above, and is a relevant part of why this paper questions the age estimation methods: that you can come up with such different results, even using the same methods, as Morelli and Myres do). Anyhow, I do not expect you to change your opinion on the matter unless impossible to dribble evidence arrives (such as unquestionable ancient DNA data, not very likely to arrive any time soon) and that is one more reason to appreciate your capacity to admit that STR-based age estimates are finally dead (and not just hopelessly dying) and this paper is the funerary slab. There is an interesting indication also today at Hawks' blog on another reason why the molecular clock estimates are systematically too recent: that the fossil data is always interpreted too conservatively. I am astonished to find once and again claims that the Pan-Homo divergence happened 7 or even 5 million years ago, when the most recent reasonable date is 8 million years (and could be as much as 10 million). Only for this reason 15-100% must be added to all estimates. Morelli did not use the same methodology as Myres. The difference between the two can be accounted by the fact that Morelli screwed up twice (they used BATWING together with the evolutionary rate), and Myres only once (they used the evolutionary rate). BATWING already handles the dynamics of loss of variation due to drift which the evolutionary rate is supposed to encompass. This double correction accounts for their deep "Paleolithic" dates and is completely misguided. Myres et al. only use the evolutionary rate; that is wrong, because the evolutionary rate is justified in a non-growing population (see Zhivotovsky et al. 2006), and modern humans since the Upper Paleolithic, and certainly since the Neolithic certainly are not a constant-sized population. I suggest that you learn some math and try to understand these papers, rather than pick and choose what matches your preconceptions. Separately, Morelli calculated the TMRCA based only on Sardinian and Anatolian chromosomes, and estimated the R-M269 lineage to have originated 25 000–80 700 years ago) , based on the same evolutionary mutation rate [25,41] as Myres et al. I of course think that the "evolutionary rate" is less of a brutality than your method of "pedigree rate" which assumes that someone's lineage had brutal success rate, while the rest had almost zero success, what is absurd because the non-statistical accidents tend to compensate each other. Only with very low population levels and for long terms, can the addition of founder effects and genetic drift account for a reduction in the diversity of the lineages. That is why the "evolutionary rate" had to be conceived and used. It is still not free of error and it is anyhow extremely unlikely that the molecular clock hypothesis can come with any reliable method any time soon, if ever. But certainly one of the most brutal errors is to believe that someone can get his patrilineal descendants to roll over, displacing everybody else's in conditions of large expanding populations. Even if such lucky individual has some extra success, the likelihood of it lasting for many generations is exactly zero. And you need many many generations... or very low populations. And such very low populations stopped existing with the arrival of Neolithic (if not earlier with the Magdalenian and Epipaleolithic demographic boom, which may well have been more striking than all the Neolithic together). "BATWING already handles the dynamics of loss of variation due to drift which the evolutionary rate is supposed to encompass. This double correction accounts for their deep "Paleolithic" dates and is completely misguided". This is interesting to find out because certainly Morelli is the only "recent" (2010) author to make a reasonably correct claim, coherent with some Archaeology. The estimates of Myres, who wrote a good paper anyhow, and Balaresque (whose paper is awful) are untenable. Busby certainly smashes Balaresque 2010 (sometimes cited as 2009) and that's one of the reasons I just love this paper: because, excepting the harshness of the tone, which I am not shy about, they make virtually the same criticisms I made to this paper when it was published a year and half ago (and then unduly hyped by certain media and certain pop-gen online personalities, more worried about fulfilling illusorily their wishes than acknowledging the many shortcomings and biases that piled up in that horrible, almost unsalvageable, paper). Maths are just tools of reason (and I don't see you filling up your entries with equations anyhow). The problem is not how many descendants a man MAY have after N generations (pedigree rate) but how many descendants he actually has, which is affected by the competition with other lineages, with the descendants of other men (as we're talking Y-DNA). Even assuming that the "founding patriarch" had a most competitive genetic package (could be mere luck too for what I know), genes don't go mostly in the short Y chromosome, so his grandsons are only 25% this man on average and his great-great-grandsons only carry some 6% of his genes. Whatever genetic super-powers this guy had got diluted and lost, while randomly other "supermen" are arising elsewhere. In the end these accidents cancel each other, at most barely tainting the pre-existing landscape. The only REAL way for a lineage to become hegemonic or even fixated is founder effect coupled with genetic drift. And for that we need small (pre-Neolithic) populations. This is statistics and this is population genetics. I'm not going to tell you what you need to learn, because it sounds a bit unduly arrogant in your text, but I do think you should meditate on this issue because there's simply no way, no matter how many equations you hide it under, that a lineage can expand in a stable to growing population "just because", while at the same time pushing the rest of lineages to near extinction or even total extinction (no rest of any Paleolithic lineage anywhere?!) also "just because". For all you and the rest talk of the "pedigree rate" I have yet to read a half-decent explanation on how any such "superlineage" could become dominant in so few generations displacing so many others. It makes no sense and you fail to explain it in any comprehensible way. But population growth was very peculiar, and nothing like exponential: it occurred in steps over a handful of generations each time (an innovation took hold), thus leading to larger populations with initially no additional diversity. Also, if you take the hypothesis of an early origin of R1b in Europe at face value, recent (say, post bronze age) population growth does not even enter. You don't need exponential growth. The evolutionary rate that is 3.6x slower is invalid as long as either there is an exponential growth with a very small exponent, or an initial spurt of growth that brings population numbers up. Population crashes have negligible effect on Y-STR variance. @Maju, your whole example indicates that you don't understand anything. My analysis does NOT require "genetic superpowers", only a modest degree of growth (of a few percent) and/or a short period of intense early growth. Both are likely to hold over time, since (a) our species has increased several orders of magnitude since the early Neolithic, and (b) farmer colonists are likely to have experienced spurts of high growth in virgin territory. Completely irrelevant, as any selection acting on the Y-chromsome (which is NOT necessary for my analysis to work) doesn't care one iota that the rest of the genome of the founder might be diluted. I have yet to read a half-decent explanation on how any such "superlineage" could become dominant in so few generations displacing so many others. You can't explain math, you gotta do it. Even if you can concoct a peculiar population history where Y-STR variance is kept low by drift in a small hunter-gatherer population in Europe, you still are faced with the overwhelming problem of explaining how West Asian R-M269 haplotypes are so similar to European ones. Drift could potentially hold down BOTH European and West Asian R-M269 variance, but it would not affect age estimates derived from comparing European against West Asian R-M269. I do understand perfectly that there is no way to reach near-fixation in "normal" (modern-like) large populations. Nor anything of the like (i.e. not even growing from 0.001%, one individual in a million, to 10%, 100,000 individuals in that same million - assuming, just for simplicity here, no growth). Only with mass genocide could that be possible. And that is not considered in your theorem. In fact not even with mass genocide it is possible because otherwise we'd see that kind of founder effects in places like the USA, Australia, etc. And, where they exist at all, they are extremely localized. "You can't explain math, you gotta do it". Do math then, I promise I will understand it (and if I can't, I'll learn fast). Just because you can draw the big sigma and calculate the result, that does not mean you have it right. In fact your insistence in hiding behind "maths" is highly suspect. But let's debate maths if need be, I have no problem (other than their aridity and the fact that they only encase a logical expression and nothing else). That's not something "I can conoct", that is something easy to demonstrate experimentally in so many isolated populations of Andaman, Papua, etc. Where a population is small and isolated, drift eventually produces (quasi-)fixation. "... you still are faced with the overwhelming problem of explaining how West Asian R-M269 haplotypes are so similar to European ones". I tend to work with haplogroups rather than just haplotypes, which can be very misleading. But Busby claims in this paper that some markers take some 20 Ka. to mutate - yet he also argues that we can only know that for the recent state and not the ancient state, what is why the molecular clock is useless and likely to remain that way. Do math then, I promise I will understand it (and if I can't, I'll learn fast). Been there, done that. It's now your turn to do the math and prove me wrong, and, no, arguing with soundbites, like "Only with mass genocide could that be possible. And that is not considered in your theorem." is not doing math. In fact your insistence in hiding behind "maths" is highly suspect. One can't hide behind math, since math is brutally honest and can be replicated by anybody. One can hide behind words, of which you have plenty. I expect a working mathematically formal model to justify how something that appears to be a few thousand years old by every method known to man, actually goes back tens of thousands of years to the Aurignacian. Don't bother with more empty words. The paper could just as easily have been titled "An epitaph for Y-STRs"... Of course, Y-STRs ... will continue to be used and analyzed for at least a few years more. Thank you gentlemen for light moments of good laugh during and after reading it and some follow-up comments. I understand that Dienekes wanted just to provoke a discussion. And he has apparently succeeded big time. A few brief comments. (1) The paper is funny. The BBC "yellow" description of it is much funnier. (2) Of course the "population mutation rate" by Zhivotovsky and his followers is nonsense. (3) Of course mutation rate constants (for a haplotype of a certain format) depend on a selection of markers. In my paper in J. Genet. Geneal. (2009) a list of more than 20 haplotypes was published, each with its own mutation rate constant. (4) R1b1a2 (the most likely L11 which soon gave P312 and U106) came to Europe about 4800 ybp, and it came from the South West (guess how), and some L23 came into Europe from the South-East (guess how). (5) L23 "age" in the Caucasus and Anatolia (and the Middle East) is around 6000-5500 years. (6) R1b1b1 branches in Central Asia presently are around 1000-2000 of "age", however, they are SO FAR AWAY from the European and Caucasian R1b1b2 by their mutations, that THEIR common ancestor lived around 16,000 years ago. And so on. Hundreds of pages are written about it. And there are hundreds of calculations of "ages" of populations based on their haplotypes, mutations and mutation rate constants, many of which nicely fit to archaeology and linguistics estimates. Good luck. Please do not argue when you are not REALLY familiar with methodology of dating of mutations, haplotypes, subclades, etc. The "mass genocide" of NW Europeans (I1) by the Bronze Age Indo-Europeans is congruent with that R1b IEs may indeed have wiped out earlier Iberians. Remember that the IEs used horses and bronze weapons when they invaded land, which would have given them a strong military advantage and would have allowed them to hunt down and exterminate the Iberian farmers. We know that IE Bronze Age gods were "warrior gods" in contrast to the "fertility gods" of the pre-IE farmers. So we have a highly militaristic IE culture that is armed to the teeth and ready for slaughter and that apparently wiped out pre-IEs in the NW at around the same time. Link? If I do not know which are your arguments, mathematical or not, I cannot attempt to refute them. "One can't hide behind math, since math is brutally honest and can be replicated by anybody". One can perfectly hide behind fallacious formulations. Platonists made that for centuries until Kepler found that the very concepts implicit were wrong: prejudices, beliefs. So bring forth your "math", and let's see what it's worth. "The classic demic diffusion model is dead"
The linked post is on the death of the acculturation model. I would generally think of a demic diffusion model as the opposite of a acculturation model. Am I missing something? The math is in several posts of the Y-STR series, which I will not repeat for your amusement. How about yours? Kepler took the circles out of the skies by proposing a model based on ellipses that better agreed with the evidence. If you want to refute my model, you'll have to do it with math, not empty words. Both models are dead. The Neolithic did not spread in the way described by the demic diffusion model, and agriculture was not picked up by hunter gatherers in the way described by the acculturation model. Rather it spread by rapid movements of small groups of farmer colonists by land and sea that barely interacted with the local foragers, they did not "mix, diffuse, mix, diffuse" as the first model proposes, nor did they teach the surrounding foragers how to farm. Good thing that they exist as electronic bits, because it would be an awful waste of paper. I just noticed that there is an eLetter feature at the Proceedings B website; it may be a good idea to post one. Link(s). I do not have to search for YOUR arguments, D. That is your responsibility. Out of three statements above one is generally right, the second is probably right, the third one is certainly wrong. The first: I1 in Europe have a common ancestor of around 3400 ybp. Examples: Central Europe 3425+/-350, Eastern Europe (including Russia) 3225+/-360, Germany 3225+/-330, the Isles 3425+/-350, Scandinavia 3375+/-350 ybp (the last one with a completely different base haplotype). The second: It seems that I1 and R1a1 were indeed wiped out from Europe between 4500 and 4000 ybp (only those R1a1 who fled to the Russian Plain about 4600 ybp survived). Incidentally, it coincides with times for population of Europe by R1b1a2. I1 started to re-populate Europe around 3400 ybp, R1a1 - around 3000-2600 ybp. Currently there are about 18 DNA-lineages of R1a1 in Europe, all with common ancestors between 2800-2500 ybp and later, to about 2000 ybp, most (if not all came from the Russian Plain, from the East). Third: R1b1a2 when they arrived to Europe had not been Indo-Europeans. They spoke non-IE languages. The VERY FIRST indication to a IE language of the CURRENT R1b1a2 is in Kelts, about 500 years BC. However, nobody knows which haplogroup was in those Kelts 2500 ybp. Since they have reportedly arrived from the South Russian steppes (arguably so, however, some historians insist on that), they might have been R1a1. It also conicides with time of re-populating Europe by R1a1 (see above). P.S. I understand that it is hard to swallow right away, however, before to argue, please find ANY proof of an IE language for R1b1a2 4800-3000 ybp. However, there were plenty of non-IE languages in Europe those times. >>Anatole: And so on. Hundreds of pages are written about it. And there are hundreds of calculations of "ages" of populations based on their haplotypes, mutations and mutation rate constants, many of which nicely fit to archaeology and linguistics estimates. >Dienekes: Good thing that they exist as electronic bits, because it would be an awful waste of paper. Words, words... Someone might say exactly the same thing about THIS blog, however, you would dismiss that outright as unsubstantiated and evil, and you would be right. It ain't my responsibility to waste my time to cater to your lack of basic computing skills, nor do I make a habit of arguing with those whose only mode of argument is verbal and not quantitative. Until I see math, this conversation is over. They're welcome to it. Reality will decide who's right, and who's wrong. "Both models are dead. The Neolithic did not spread in the way described by the demic diffusion model, and agriculture was not picked up by hunter gatherers in the way described by the acculturation model. " Neither of the models are dead or even injured. Quite the contrary. When we look at early neolithic cultures in Europe they consist of mi-haplogroups present before the neolithic and Y-haplogroups that represent minor groups in Europe today. Not the expected result if small groups of immigrants arrived from Anatolia and swamped the aboriginals. The key proposed haplogroup markers (J for example) of the neolithic in the east do not dominate modern Europe. There is not enough evidence yet. But what there is does not favour neolithic genetic dominance from the East. The great mathematician and a chemist as well Anatole Klyosov insists. Your calculations are completely wrong because you don’t take in considerations that there are mutations around the modal and a convergence to the modal as time passes, except for those clades that fix mutations far from the modal itself. Your theory doesn’t explain that R-L51 arose in Italy (a few minutes ago Janzen on Rootsweb: “This distribution would favour an origin of R-L51 in Eastern or Southern Europe, possibly in Italy”, what I am saying from many years) and why the 3 most important subclades was born: R-U152 in Central-North Italy, R-L21 in the British Isles and R-U106 in North Europe. Sorry, I do not undestand gibberish. If you mean that calculations in DNA genealogy do not consider reverse mutations (back mutations), you are utterly wrong. This is a very important part of calculations. A long table of corrections for back mutations was published in J. Genet. Geneal. (2009), they were employed in a paper on Cohanim/Cohens in Hum. Genet. (2009), and in a dozens of other papers. My "theory" does not reject it at all. The "age" of R-L23 is ~6200 ybp, with a good amount of the in the Caucasus, Anatolia, the Middle East. The "age" of the downstream L51 is 5300+/-700 ybp, the "age" of downstream L11 (in Iberia) is ~4800 ybp, the "age" of downstreams P312 and U106 is around 3900-4200 ybp, in Iberia and/or France by land and probably the Isles by sea. As you see, L51 could have arisen in Italy, why not? Just do not be nervous, be constructive. It is more productive. This is your problem - "saying". Science is not "saying", it is "proving". >R-U152 in Central-North Italy, R-L21 in the British Isles and R-U106 in North Europe. The fantasy late dates suggested by Anatole conflict with actual ancient DNA data. That's why he needs to postulate that virtually all European y-DNA got wiped out in the bronze age (but not J or E, for some reason). Of course, there is ample of archaeological evidence for cultural continuity through the bronze and iron ages in much of Europe... but who cares about hard facts. To say something is better than to say nothing. My plane discourse, not stuffed of mathematics, was the result of studies, data, maps (those really done by Argiedude). This study of Busby and others (but we cannot ignore that the grey eminence is Cristian Capelli) is very interesting and there mathematics doesn’t lack. For instance we know (what your compatriot Khusnutdinova didn’t want ever to say to me) that the “Russian” overwhelming R1b1b2, that of the Bashkirs, is totally R-U152, like we “said” in examining some haplotypes. It would be interesting to know which subclade, but they are pretty the same, then derives probably from a single individual and I hope you doesn’t want to theorize that the 43% of North Italians derive from a Bashkir, with all the respect for them. >The fantasy late dates suggested by Anatole conflict with actual ancient DNA data. "Actual ancient DNA data"?? For R1b1a2? For I1? "Actual ancient data" please. No more words without substance, please. 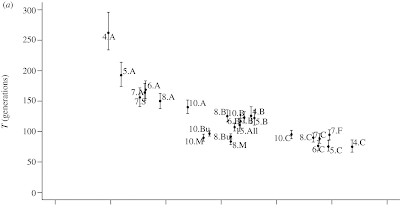 The oldest "actual ancient data" for R1a1 is 4600 ybp (Haak et al, 2008). In agreement with "fantasy late dates suggested". Incidentally, those excavated R1a1 were "wiped out". Using stone axes. It might be a coincidence. It might be not. Soon after it R1a1 had disappered from Europe, and left only eastward, with a common ancestor of ~4600 ybp. Go ahead, challenge me with the last "fantasy late" date. Make my day. >To say something is better than to say nothing. It depends. To say something stupid or plain wrong is no better than just to say nothing. See below, on the Bashkirs. My opinion is quite opposite. The only value of the paper is in dismissing the preceding study which was even worse. Nothing new, we knew it. Also, it was negative on Zhivotovsky "method". Nothing new, we knew it. What else? None. Not true. There are plenty of R1b1b1. However, what is wrong with being R1b1a2-L23, and R1b1a2* with a common ancestor of 7,000 ybp? To your knowledge, more than 30% of Russian R1b1a2 have DYS393=12, compared with a predominantly DYS393=13 in Europe. If, of course, it tells you anything. >...that of the Bashkirs, is totally R-U152, like we “said” in examining some haplotypes. Not true. There are plenty of R-M73, R-L23 (5500 ybp), R-M269 among the Bashkirs. There is a recent line of R-U152, so what? In one particular dataset there were twenty haplotypes R-L23, ten R-M73, one M269*, eight U152. All eight U152 had identical haplotypes, hence, a VERY recent line. So what? >I hope you doesn’t want to theorize that the 43% of North Italians derive from a Bashkir. It a way, yes. 43% of Nothern Italians belong to downstream subclades from the Bashkirs. Including your beloved L51, which is an immediate downstream from L23. >The "age" of R-L23 is ~6200 ybp, with a good amount of the in the Caucasus, Anatolia, the Middle East. The "age" of the downstream L51 is 5300+/-700 ybp, the "age" of downstream L11 (in Iberia) is ~4800 ybp, the "age" of downstreams P312 and U106 is around 3900-4200 ybp, in Iberia and/or France by land and probably the Isles by sea. As you see, L51 could have arisen in Italy, why not? Just do not be nervous, be constructive. It is more productive. 1- Why were your two papers published in the Journal of Genetic Genealogy http://www.jogg.info/ a free open access Journal? 2- Who peer-reviewed your studies, because in both of those published in the Journal of Genetic Genealogy there isn’t any mention of a peer-reviewer. 3- You mention that you published the following paper: “DNA Genealogy, Mutation Rates, and Some Historical Evidences Written in Y-Chromosome” in Nature Procedings(Pre-Publication research and preliminary findings) http://precedings.nature.com/documents/2733/version/1 yet your paper never made it to any of the Journals published in Nature.com. 5- Can you honestly say that the samples you used in your papers (i.e. The “Basques” from the FTDNA Basque DNA Project) are both reliable and an accurate representation of the Basque people living both in Spain and France. Didn’t it puzzled you the fact that many of those people found in that project hail from the New World, and that the y-DNA Haplogroup profile(i.e. Presence of Haplogroups such as E, E1b1b1, G, G2a in far greater numbers that have never been seen before) is quite different from that seen in any other peer-reviewed study done on Basques. Shouldn’t the presence of Q1a3a1 in that sample raise some concerns about the representativeness of it for Basque people of Spain? What effect do you think would have on the variance of Basques, if the population you used was not of actual Basques but that of a subgroup of New World descendants, who might not even be Basques on the first place, given that Amerindian Haplogroup Q1a3a was found among those having “Basque” surnames. >The oldest "actual ancient data" for R1a1 is 4600 ybp (Haak et al, 2008). In agreement with "fantasy late dates suggested". If your theories(About R1a or I-M170 being wiped 4600 years ago) were completely accurate(As you claim) it wouldn’t make much sense that human remains found in cave in Liechtenstein dating back 3000 ybp would turn out to have a majority(12/15 or 80%) of Haplogroup I-M170+, and even greater presence (2/15 or 13.33%) of Haplogroup R-SRY10831(R1a) than Haplogroup R-U106(S21)+, which was only found in 1 out of 15 samples. So it seems R1a was still found in Western Europe as of 1000 BC and did not disappear as you claimed above. So it begs the question: Did I make your day? Is it really necessary for a Biochemist like you to be calling the work of Geneticists epithets such as: “nonsense”, “funny”, etc; when your work has never even been published in any major peer-review Journal, nor does it fit with ancient DNA thus far analyzed. You do realize sir that your theories are far from being solid; thus I would recommend that if you want to create solid postulates, you go out in the field and collect real random samples in Europe and the Middle East and analyze the variance of those samples, instead of undermining the work of Geneticists in online blogs. @jeanlohizun, we don't care in this blog if something has been peer-reviewed, or if it's written by a biochemist or a geneticist. I vehemently disagree with Klyosov's certainty in his own estimates and his baroque prehistorical reconstructions, but I'd never base my disagreement on the venue in which his work has appeared. If R1a and I1 were wiped out 4600 ybp but were found 3000 ybp it is no problem. Everybody knows and they have exist and thus have returned, and Klyosov has not denied it. In 1600 years, about 400 generations it is possible to rebuild populations. Not everybody was killed but remains were left for I in local pockets and R1a in Russian territory, if we want to simulate the Klyosov view. My disagreement is not based on the venues of where his works have appeared or not. I was genuinely asking him those questions? I was indeed puzzled by the very unprofessional way he disregards this studies without actually explaining what is it that he thinks is wrong. Nothing more nothing less, he asked for ancient DNA evidence that might contradict his theories, and I provided such evidence. f R1a and I1 were wiped out 4600 ybp but were found 3000 ybp it is no problem. Incidentally, those excavated R1a1 were "wiped out". Using stone axes. It might be a coincidence. It might be not. Soon after it R1a1 had disappered from Europe, and left only eastward, with a common ancestor of ~4600 ybp. Well I have to say in 1600 years there aren’t 400 generations, unless one assumes a generation time of 4 years, the actual number might be closer to 64 generations using 25 years or 53 generations using 30 years. But the issue here is that one would expect that Bronze Age site to be flourishing with the Y-DNA of the R1b-M269 folks who conquered Europe from Asia 4000 ybp(via???? ), after all according to Klyosov’s theories they came and slaughtered all those poor I-M170+ and R1a carrier fellows, instead we see a vast majority of I-M170+ fellows and secondly R1a fellows. R1b appears in the site already derived as R-U106. Also the sample from the Bronze Age Cave had at least 3 different types of haplotypes for I-M170+, so it was not a pratilinear clan as one would expect from small pockets. And why not? I have more than 400 publications, some of them in free open access journals, some are sold by the publisher. I personally prefer free access. But I cannot control the publisher. The last of my papers is published in June by Springer and sells for money. What should I do? Withdraw it? I would rather send it to you by e-mail, freee of charge, if you send me your e-address. Whit Athey, if you do care. Again, why you do care? It seems you do care more on side dishes rather than on a main course. If you wish to know, Nature wanted to have a small paper (which I found unacceptable), but J. Genet. Geneal. offered to publish it in a whole lenths. Also, the whole paper was published by the World Academy of Art abd Sciences. Well, go ahead. Submit your comments to Hum. Genet. Tell us on a result. Again, why it concerns you? Yes I can, because I have received the same results from a much more representative dataset by Adams et al (2008). Do you have your own data which contradics mine? Go ahead, challenge me. Make my day (once more). You have already twisted my words. Why to use "completely accurate" then? Maybe someone should teach you that the expression "completely accurate" is not applicable to historical reconstructions? To ANY hypothesis? >it wouldn’t make much sense that human remains found in cave in Liechtenstein dating back 3000 ybp would turn out to have a majority(12/15 or 80%) of Haplogroup I-M170+, and even greater presence (2/15 or 13.33%) of Haplogroup R-SRY10831(R1a) than Haplogroup R-U106(S21)+, which was only found in 1 out of 15 samples. Why not? I1 have started to re-populate Europe around 3400 ybp, R1a1 around 3000-2500 ybp and later, however, most R1a1 lineages have common ancestors in Europe between 2800 and 2500 ybp. R1b1a2-U106 are in Europe since 4175+/-430 ybp. So, what is a problem? So it seems R1a was still found in Western Europe as of 1000 BC and did not disappear as you claimed above. Can you read properly? There are no R1a1 lineages in Europe between 4500 and 3000 ybp. However, there are lineages of about 12,000 ybp, 7,000 ybp, 4600 ybp (Haak at al, and also in the Russian Plain), and then a gap, until about 3000-2800 ybp. After it - plenty of them in Europe. More than 20 lineages, mainly in the 1st millennium BC. So it begs the question: Did I make your day? I call noncence and funny what IS nonsense and funny, and what I have reserched PERSONALLY into it, and found some published and unqualified "results" nonsense and funny. >I was indeed puzzled by the very unprofessional way he disregards this studies without actually explaining what is it that he thinks is wrong. What I have not explained? Can you be more specific? Ask your questions, however, please, keep closer to science. It seems that you are more interested in checkers on a cab, rather then in a ride. he asked for ancient DNA evidence that might contradict his theories, and I provided such evidence. You did not. You have said that my data on I1, R1a1, R1b1a2 in Europe are too recent, that is 3400, 4600 and 4800 ybp, respectively, and you implied that the available ancient excavated data are older. I have requested the DATA, and all you came with was 3000 ybp. Thank you very much, I was aware of it. So, you made my day indeed. I knew it in the first place. I know all theories in Science have uncertainty sir, no need to take the “completely accurate” terminology to the heart, perhaps you would prefer it had I said “If your theories were free of major flaws” you would have understood the terminology better. Is there any reasoning for assigning those dates, or are we just flip flopping so our theories adapt to aDNA data that you might have forgotten that existed. As for R1b1a2-U106 being in Europe since 4175+-430 ybp, well I can tell you that it has been in Europe at least since 3000 ybp, as for anything else, I can’t guarantee anything. Yes I can actually read properly, and as I already pointed out to you, in your initial statement you failed to mention R1a1 lineages being absent from 4500 to 3000 ybp, as you said they “disappered from Europe soon after 4600 ybp, only to be found eastward”. There is no evidence of R1a1 in Europe 12,000 ybp or 7,000 ybp that I know of, at least not on Haak et al(2008). But I’ll be most pleased if you could bring forth evidence that shows otherwise. Well calling something epithets such as “nonsense” or “funny” doesn’t invalidate it. As for your personal research, well if some of your samples are neither random nor representative of the population they are supposed to represent, and were gathered from an amateurish project, how are we to expect that your theories would have any validity. I’m sorry sir, but the science that I know for the most part (There are always rotten apples) lacks disrespectfulness towards your fellow scientists, and has quality control on the sampling. You have yet to say what is so funny or unqualified about the results of Bubsy et al(2011). It is not that he "has not denied it". He has found it. He has determined I1 base/ancestral haplotypes (as well as I2 ones) in every corner of Europe, along with datings of their common ancestors. He has a pattern of I1 dates in Europe and beyond. The same is with R1a1 and R1b1a2. You can read all of it on his website http://aklyosov.home.comcast net. There are more than 30 issues of Proceedings, each packed with ~200 pages of haplotype calculations and historic reconstruction. Also, critical reviews of papers on Y-chromosome calculations published in "academic journals", including Balaresque, Morelly, Zhivotovsky, Hammer, Adams, Haber, Myres, Hua Zhang, Cruciani and many more. Not 4000, but around 4800 ybp. If you want to know "via" where, ask me. But ask politely, and wipe your feet first. I may explain. they came and slaughtered all those poor I-M170+ and R1a carrier fellows, instead we see a vast majority of I-M170+ fellows and secondly R1a fellows. Nice. Where and WHEN do you see them? That "vast majority of I-M170 and R1a"? R1b appears in the site already derived as R-U106..
Nice. Please define "the site". Europe?? Where on Earth did you get it? Date, please. Do not try to be elusive. Before 3400 ybp? 4500 ybp? Make my day once more. I like it. Let me step into this heated discussion, as an outsider. First, everyone has a bias, and many of your biases show in your posts. To those postulating a very recent entry into Europe of R1b, I have to say: you can use our current state of calculating these things, which is woefully misleading, as Dienekes himself says. But nothing can save the fact that the purported result lacks a hypothesis. In other words, the scientific methodology needs a hypothesis that it seeks to test or prove or disprove. And your hypothesis is so damn wacky, your "evidence" can't prove a thing. Consider the following questions, and go for it: try to answer them, and you *may* be coming toward a hypothesis. --Why are so many Basques R1b? --Where is the evidence of cultural overwhelming or mass genocide? --Has any empire on the globe conquered such vast swaths of land in the time frame you propose? --Would it really be possible for such a conquering force to conquer such vast swaths of land without a written language and modern communication, or at least seafaring? --Wouldn't *some* pockets of the predecessor populations survive somewhere, say, I know, in the Pyrenees? See first bullet point above. --The Spaniards had Guns, Germs, and Steel. Yet many male Indians and male mestizos with Indian origins remain. Are we to believe that these prehistoric ubermenschen you describe left no trace of the original populations they conquered? --What language do you purport these colonist/conquerors spoke? --If the proto-Basques and proto-Etruscans (Villanovans) were lumped with this R1b ubermensch conquering wave from the east, then why did they speak non-IE languages? Under your model, when did the vast Indo-European shift happen? Or was there another wave of conquerors? In sum, get a hypothesis and then we'll talk proving or disproving it. You're not even at step one. The best evidence from all sources (linguistic, genetic, historical, logic) still supports the conventional view of a series of expansions of different populations more or less conforming to the principal components of Cavalli-Sforza so many years ago. A population of modern humans entered Western Europe many years ago. It expanded. The best candidate is R1b. Another population developed farming in the Middle East. It expanded, initially northward, in a demic diffusion. Best candidate is J. After taking up the basics of farming and pastoralism, after further millenia had passed, it was the turn of the mostly R1a population in Eastern Europe to expand. With the domestication of the horse, they were able to slowly spread their toungue to far-flung locales as India and Ireland. Just like with Spanish-speakers today, you have some populations (Costa Rica/Uruguay) with mostly pure invader stock. But the majority of the populations (Mexico, Guatemala, etc.) are only linguistically and culturally "invaders" while their genetics remain indigenous. The only way to explain Indo-European languages in India and Ireland is with R1a/J2. Thanks, Jean, you saved me some work. The good news is that wonky "ideas" like those of Anatole in the end can't keep up with the number of parameters they need to twist and turn and postulates they need to add to fit reality. “The best evidence from all sources (linguistic, genetic, historical, logic) still supports the conventional view of a series of expansions of different populations more or less conforming to the principal components of Cavalli-Sforza so many years ago”. 2) subclades of R1b1* are above Italian I think and Eastern R1b1a2* could have come from here. Why to think to an only flux from East to West? I have given many proofs about mtDNA born in Europe and in Italy and migrated to East and South East: HV4, U5a2b, etc. 3) the path from R1b1a2* to R1b1a2a/L150- (Romitti), L150+ (me too), L51+ is clearly Italian. 4) I have said that the expansion from Italy to West and Central-North Europe happened 7500 years BC with the agriculturalists-seafarers from the Grotta delle Arene Candide. This fits also with Busby’s data. 5) certainly R-U152* was born in North-Central Italy. Re the other two huge European haplogroups (L21 and U106), by their actual diffusion concentrated on the British Isles and Central-North Europe, it isn’t said thatt hey two aren’t born in Italy. I am investigating that which seems the most ancient L21 haplotype (that of the Italian Argiedude) and perhaps I found its rooting in Italy. Of course the hypothesis that Italian R-L21 could have come to Italy with Lombards or others is always taken in consideration. First, a note: no more talk with "jeanlohizun" unless he presents here DATA on excavated R1b1a2 before 4800 ybp, on excavated R1a1 before 4600 ybp, and/or on excavated I1 before 4000 ybp. The fantasy late dates suggested by Anatole conflict with actual ancient DNA data. His elusive "conflict" does not tell whether "my" data are older or younger that "actual ancient data". If he meant data on 2000-3000 ybp, I do not see any conflict. If he meant data on, say, >5000 ybp for R1b1a2 in Europe (which he did not provide), I would certanly see a conflict. If he would provide data >4000 ybp on I1,I would not see a conflict, since ~3400 ybp for I1 was a bottleneck for I1. There must be earlier I1, we just do not see them from haplotypes as yet (except a few arguable ones). If he would have provided data for R1a1 in Europe older than 4600 ybp, there would be no conflict either. However, I would be happy to see them. It would fit my data for 7,000 ybp (and older) in Europe. However, nothing of that kind was provided. No more talk to "Jean". >Nothing like the most common European haplogroup to get everyone's blood flowing. Any problem with the above? Actually, the first part is a description by Haak at al (2008), then I said that it might be a coincidence, and it might be not, and the third part is solid experimental data. Indeed, there are three different in kind common ancestors of R1a1 deduced from the current European haplotypes: ~ 11,000 ybp, ~7,000 ybp, 4,600-4,800 ybp. The third one was supported by Haak et al data, though I had published the data a few months before the Haak's paper. Then there is a gap in R1a1 lineages in Europe, until about 3000-2800 ybp, and since 2500 ybp there is a whole bunch of them. In other words, there is a gap between about 4500 and 3000 ybp in existence of R1a1 in Europe. Incidentally, those were times of populating Europe by R1b1a2. What is wrong in connecting the two events? Furthermore, I1 disappeared from Europe around the same time. All European I1 started from about 3400 ybp. A coincidence? That is why when I cited Haak about R1a1 killed with stone axes 4600 ybp, I wrote - a coincidence? May be yes. Maybe not. Since then hypotheses based on experimental data are prohibited? Go ahead, suggest your hypothesis. If you really want to discuss things, please do not be elusive. What is "a very recent entry into Europe of R1b"? 1000 years bp? 2000? 4000? 5000? Second, please explain "misleading". Do you really know the methodology, as I have explained it briefly above? Have you realy done the calculations, and found that they are based on wrong assumptions? If yes, please go ahead, say it. Then we continue. Otherwise it would be a waste of my time. There is an exit strategy for you, however. Just say - sorry, in fact, I have not tried, and am not qualified, I just repeated what some others said. Apparently you are unaware that there are hundreds of those calculations published, that it is a well-developed field of DNA genealogy, that those approaches are calibrated based on actual genealogy and historical events, that those calibrations are based on dozens of actual experimental data points. That the data obtained are scrutinized big time, using different approaches. That a whole bunch of knowledgeable people work in the area, and they cross-verify values of the mutation rate constants, methods of calculations, results obtained, and so forth, and publish those corrections, if any, for the last several years. And they are not amateurs, they are PhDs and professsors in physical chemistry and similar disciplines, who know how to treat time-dependent processes, including mutations in Y chromosome. After you realize it and explain (or take back) your childish words, we will continue, and I will answer your questions. ...wonky "ideas" like those of Anatole in the end can't keep up with the number of parameters they need to twist and turn and postulates they need to add to fit reality. A common thing between you guys is that you never prove what you say. You just say negative thing on passing, that is all. No specifics. It is VERY un-scientific. the first article there is completely on R1b1a2 in Europe. Dates for all principal subclades are calculated based on haplotype datasets. The methodology of calculations is described, dozens specific examples are given. Pick some, and show what is wrong. By the way, there are many calculations there based on the logarithmic method, compared with a "conventional" one, based on mutations. Show me, that margins of error are unacceptably wide, as Dienekes claimed, without trying one, I think. This would be a proof. Or lack of it, on which I bet. Maybe this will give you guys a lesson. Sorry to say, your first question was a bad choice. To identify present high frequency in an area with antiquity in this same area is the first fallacy outsiders make in this field. This made me lose interest in the rest of your questions. R1B in Basques in basco-cantabric area since paleolithic, pls show us your best arguments and evidences i/o bad questions. Same for Basque language: fyi the oldest attested evidences about Basque language, coming from Aquitania, are some onomastic from around II century a.d. (source:Trask); and almost all the toponimics in Basque Area can be explained by Indo-european. (Source: Villar). Uninformed and unconstrained speculation and archeologic fantasies are not welcomed. Firstly why on Earth are you referring to yourself in the third person? It almost seems as if you were the “Pikeperch” character and you forgot to log out as Anatole? But that is irrelevant to the topic at hand. Again how do you determine the ancestral/base haplotypes of I1 with the data that you have readily available online? Firstly you need to learn what quality control is man, do you even know how abnormal the Y-DNA Haplogroup profile of the FTDNA Project on Basque is? This is the problem with amateur Geneticists like you, because you lack the funding and the equipment required to actually go out on the field and collect data you end up using data collected from others. Often times, like it happened in your case your data turns out to be highly unreliable, and yet you have the nerve to say that it is somewhat representative of all of Europe, and solid enough to reconstruct some pre-Historic event that only exists in your world. Exactly there are tons of issues of Proceedings of the Russian Academy; so the deal is why hasn’t any of you paper made it yet into any major scientific journal? Why are you the only publisher in each one of those papers? What’s going on? I don’t need to ask you, instead I would say that in figure-6 in the Adams et al(2008) paper clearly shows Moroccan haplotypes to be derived from the Iberian ones. I already said it and provided a link, but if you want I’ll do it again. When: 3000 ybp Urnfield Culture. Site: Liechtenstein Cave, Europe, 3000 ybp. I’m sorry but this is the third time I have to repeat myself, and don’t try to play judge on me, is tiresome. You very well know by now (I hope) that it is 3000 ybp. What kind of strawman argument is this? When have I mentioned anything about aDNA showing R1b1a2 prior to 3,000 ybp. Well then I guess we are done talking, because you very well know that there isn’t any ancient DNA data thus far that have yielded R1a1 or R1b-M269 prior to 4800 ybp. The only ancient DNA predating 4800 ybp has turned out to be overwhelmingly G2a in France, and 2F*(x,I,J,K,G,H) in Central Europe as well as a G2a. Instead why don’t you provide us with excavated data for R1a1 in Europe 12,000 ybp present like you claimed, or 7,000 ybp, since you are making that claim. Man now you are grasping for straws. Why are you twisting my words now, and trying to say what I meant or what I didn’t meant. You are the one that claimed that R1a1 was in Europe 7,000 ybp and 12,000 ybp, why don’t you back up your claims. Firstly you claim that R1b-M269 folks started conquering Europe between 4000-5000 ybp, and they drove R1a folks Eastward and I folks almost to extinction because most of the TMRCA for R1a in Europe is 4600 ybp according to you data. But if such was the case, firstly there would be massive graves and extinction events during that time period in all of Western Europe, especially in the SouthWestern France, Northern Spain. There is not, at least not in Iberia. There are signs of violence in SJAPL(San Juan ante Portam Latinam), but the site dates back to 3365-3035 Cal BC or 5046-5375 ybp, certainly prior to the start of the bronze age, other than that, there aren’t any signs of violence or cultural change in the area. Nonetheless if “R1a” and “I” folks were almost annihilated as to cause bottlenecks in the 3000-4500 ybp range, then in order for the Liechtenstein cave to be mostly I-M170+ folks with at least 3 different haplotypes, there must have been some sort of extinction event(again) that drove the already “prosperous” R1b-U106 folks back to hiding from the area. So according to your theories we should be finding massive graves and evidence of violence on the period from 3000-4600 ybp in Europe. Is that the case? 4029T 4232C 4907C 6975C 9921A 12378T 14133G 16041G 16189C 16287T 16526A”. When have I mentioned anything about aDNA showing R1b1a2 prior to 3,000 ybp. Excellent. I am satisfied. You made my day again. >>The fantasy late dates suggested by Anatole conflict with actual ancient DNA data. In other words, your elusive but negative comment (elusive, since you have avoided to indicate what are "fantasy late dates" and what are "actual ancient DNA data") failed under a little scrutiny. Hence, again a lesson to you: when comment, be clear. R1b1a2 4800 ybp in Iberia, 4500 ybp in Central Europe as a superposition of many lineages, and many downstream subclades dated in the reference I gave above. I repeat: there is no any conflict of the above data with archaeology. 3000 ybp is younger then those. 4600 ybp fits nicely. For R1b1a2 there are only recent data, and in one case for 5,000 ybp excavated R1b1a2 were not found (in France). So, we are done with archaeology. No conflicts. you very well know that there isn’t any ancient DNA data thus far that have yielded R1a1 or R1b-M269 prior to 4800 ybp. Exactly. I do know, you are right. All other your negative and otherwise comments are just your interpretations. Some of mine conclusions are also interpretations, however, what makes you think that your interpretations are better than mine?? There are lots of gaps in our knowledge, in any scientific field, by the way. Why to jump so aggressively when someone like me advances a hypothesis based on data obtained and on observations? What kind of "brain structure" does it reflects in those aggressive attacks? Do you have anything better? Go ahead, suggest something positive. A hypothesis, for example? Which would explain, more or less, DATA? why don’t you provide us with excavated data for R1a1 in Europe 12,000 ybp present like you claimed, or 7,000 ybp, since you are making that claim. Do not jump. We have not finish our business with your preceding statements. What you have mentioned, is published. Read the literature. Man now you are grasping for straws. Do you need more lessons? I repeat: stick to scientific issues. All what I say is based on data and their interpretations. If you have isssues with my data, advance yours. If you have issues with my interpretations, I could nor care less. Have yours. Or show which DATA my interpretations contradict. Not your thinking. But if such was the case, firstly there would be massive graves and extinction events during that time period in all of Western Europe, especially in the SouthWestern France, Northern Spain. Again, it is your thinking. I do not know what "mass graves" there should have been, and where are graves of millions of other folks from those times? Can you distinguish one from others? I cannot. Then, have you heard of "Archaeological culture of crushed skulls"? Look it up. Again, it is my interpretation. If you have another way to explain where I1 gone before 3400 ybp, please do me a favor, explain. Or you think that I1 have appeared only 3400 ybp? No? Where their "mass graves" then? So why do you say that they were none? Why the "Bronze age" label is so important for you? I can comment on the event separately, if you ask me, and I will quote some haplotype dating possibly related to the event. And can everyone stop with the personal attacks. Its amusing but distracting. No one wins arguments here by intimidating the opposition into silence. Why is it that one of my comments did not show up? I didn’t even said that, it was another user, but anyhow thanks for the side tracking comment, and once more the well underserved strawman argument. Well starting with the fact that half the samples you used to calculate the STR variance in Iberia came from the FTDNA project in Basques, which is highly unreliable and far from being a representation of actual Basques, and ending with the fact that you have no way of determining which one is the "phantom" haplotype, I think it pretty much settles that all your calculations are far from reliable because they lack any sort of quality control in the data. So tell me Dr.Klyosov can you extrapolate data for Fatigue Failure for Aluminum 7050 to Stainless Steel 2205? The answer is pretty clear: NO!!! The same way you can’t extrapolate data from an FTDNA project made up of New World descendants of “Basques” (who might be already lacking in diversity) to the Iberians in Europe. I haven’t even given my interpretations here, but I’m simply showing you some historical data that seems to contradict some of your interpretations. I could tell you thus far, from the variance calculated by Bubsy et al(2011) that the highest variance for R1b-M269(xS127) doesn’t happen in Anatolia or outside of Europe, but in Central Europe. So again, randomly collected data, published in a peer-reviewed study has yielded completely different conclusions from your “data”. I know they didn’t calculate TMRCA, but the variance speaks for itself. I’m sorry but I haven’t yet been able to find a single piece of literature showing aDNA that supports that R1a was present in Europe 12,000 ybp or 7,000 ybp. That’s quite easy. Take a look at figure-2b) of Bubsy et al(2011) displaying the variance of R1b-M269(xS127) which turns out to have the highest variance in Central Europe. Not something one would expect had the haplogroup originated in Anatolia, or expanded to Central Europe from Iberia. As far as I know, at least in Northern Spain there weren’t any massive graves or signs of population replacements dating back to 3,000 to 4,000 years ago. The only case is that of SJAPL which dates back to 5,000 ybp and it was probably tribal violence as only 5 to 6 individuals out of +300 had signs of violence. Malyarchuk et al(2011) using the the evolutionary effective mutation rate of 6.9x104 per 25 years based on STR variation got a divergence time between these Q1a3(*)-M346 haplotypes and Amerindian-specific haplogroup Q1a3a-M3 equal to 13.8±3.9 Ka. So what would happen if we were to divided that number calculated ysing the “nonsense” evolutionary effective mutation rate by 3. It seems that using different data to calculate the time of divergence for Q1a3a yielded completely different results. So here is my challenge to your methodology, why don’t you calculate using your methods the TMRCA of that particular sample, and then let’s talk. Anyhow if you could possibly link a haplotype dating to the event, then sure why don’t you tell us. Note the "avoid double-posting" rule when you post a comment. I will begin enforcing this rule from now on, so, everybody, gather your thoughts to a single comment. You do not need an "interclade", it would be misleading. These two haplotypes are sitting on two opposite sides of a bell-shaped curve of probability of mutations in P312* haplotypes. Instead, you should add to them the base (presumed ancestral) haplotype for P312*, and consider the three haplotypes as a minimal dataset. If you do it, you find that those three 37 marker haplotypes have collectively 33 mutations from the base haplotype (it is on the top of the bell-shaped curve mentioned above) [there are two palindromic mutations in the two haplotypes, which you should count as one mutation each]. It translates to 3500+/-700 years to a common ancestor for these three haplotypes, which IS pretty close to the actual figure for P312* in Europe. In other words, in spite of weird mutations in the two haplotypes, they both belong to the P312 family. Next ones go in the trash. One more suggestion for you. Please avoid negative comments, such as "not something one would suggest...". Please be direct and say what you need to say. Otherwise others should guess what you intended to say. Let me guess what you wanted to say (if anything). Since R1b-M269(xS127) is essentially R-L23 (that with mainly DYS393=12 unlike largely DYS393=13 in Europe), you imply that L23 is the oldest one in Central Europe ("highest variance"), and, therefore, it could not come from Anatolia. And, as you say, it could not come from Iberia either. Am I right with my guess? Is that you wanted to say? If so, you are wrong. First, nobody says that L23 came from Iberia. Not me, at any rate. L23 is one of my favorite subclades, and I know a lot about it. There are VERY many of L23 in the Caucasus, in Anatolia, and in the Middle East, and in all the three locations it is around 6,000 years "old". There are some L23 in the Balkans, apparently, from Anatolia, and maybe partly from nowadays Russia, where is also a good amount of L23. About 30% of the Russian R1b1a2 have DYS393=12. There is a little fraction of those in Iberia. There is not much of them in Europe. It seems that R1b1 were moving from Central Asia as R1b1 --> R1b1b1, and then -->M269* -->L23 --> L11, etc. L11 entered Iberia (4800 ybp), it seems, then gave P312 and U106 (between 4500 and 4200 ybp), and those as Bell Beakers moved up North to the continental Europe. The dating fits the Bell Beakers. The direction fits too, though some folks think that Bell Beakers were moving from North to South. I doubt it, and the haplotypes say that the direction was from Iberia up North. I did not realize that by double post you meant a quotation. I thought it is an accepted practice here. O.K., no quotations then. Boy, I have never thought that I need to give lessons on elementary things to my "opponent". O.K., it may be useful to others. With my "opponent", I lost hope. First, Zivotovsky "population mutation rate" does not necessarily give three times higher TMRCAs compared to other methods. It would be nice if the "fudge" factor between Zhiv data and other, correct methods would be always 3. Unfortunately, it is not so. The factor typically varies between 4 and 1. There are many reasons for that. Among them a number of lineages in the dataset, a number of branches on the haplotype tree, relative sizes of those branches, which haplotypes are employed (in Zhiv method ALL haplotypes have the same "mutation rate"), etc. The more branched the tree and the older the TMRCA, the lower the "fudge" factor, coming down from 4-3 to close to 1. Second, I1 in Europe have a common ancestor around 3400 ybp. However, in Central/Eastern Europe/the Isles the base haplotype has a VERY different structure compared with the Scandinavian base I1 haplotype. Both are around 3400 years "old", however, their common ancestor is more than 10,000 years "old". It means that old I1 vanished. They had vanished before 3400 ybp. O.K.? Do I need to explain more? Third. All available P312 and U106 haplotypes give their common ancestors in both cases around 3700 and 4200 ybp, respectively. However, a difference in their base haplotypes show that THEIR common ancestor lived 4800 ybp. In other words, both P312 and U106 should be about 4800 ybp "old". As you see, they are much younger. A rather simple question to you: what does it mean, and why "violence" can be an explanation? I thank you for your response, even though I’d be waiting from you also a response about the mt H*, which is probably the witness of an age much older that it is thought of this haplogroup. But in what you have said I think it is the mistake of your method and of everybody used and uses it. Which was the question I posed to you and to Nordtvedt (and I don’t speak of Vizachero who has returned to his plants): how is it possible that markers with a very low mutation rate have mutated many times backwards and forwards and others with a very fast mutation rate not? I said that there were mutations around the modal which falsified our count. I am not “saying” something now: I have experienced this many times in my researches. Then your P312* modal that you put like a third element in this comparison is only an artifice, just the “convergence to the modal as time passes” like I have said, but which hasn’t, unfortunately, any value to answer our questions. This play is more difficult with the mitochondrion, because there happen SNPs mutations, those that Dienekes hopes are investigated also for the Y and in the whole genome. To double post is to post two posts in a row. For example, you just triple posted. I can tolerate the occasional double post, but everyone should make an effort to combine all their thoughts and respond to everyone in a _single_ comment, and only break it into two comments if they absolutely have to. t me guess what you wanted to say (if anything). Since R1b-M269(xS127) is essentially R-L23 (that with mainly DYS393=12 unlike largely DYS393=13 in Europe), you imply that L23 is the oldest one in Central Europe ("highest variance"), and, therefore, it could not come from Anatolia. And, as you say, it could not come from Iberia either. Is funny you were complaining about aggressiveness before, yet you are very aggressive yourself. Anyhow, in Busby et al(2011) they tested for R1b-M269(xL11) not for R1b-M269(xL23) thus there is no way in telling how much of it is R1b-M269(XL23) and how much is R1b-L23. In any case the main point taken, is that in a dataset which included both Anatolian, Middle Eastern populations, and Europeans the one that achieve the highest variance in R1b-L23 was a population from Central Europe. Thus it doesn’t take a genius to realize that higher variance=older TMRCA, so there goes your argument. Here is something interesting they(Busby et al(2011)) feature 6 French Basques from HGDP, which can be seen in the excel file on the supplementary info. The French Basques had 2 people having R1b-M269 (xS127) which can be seen in Table-S1. Guess what DYS393 was for the two French Basques having R1b-M269 (xS127)? You guessed it DYS393=12. So did it get there from Anatolia too or from Russia? Or how about the 2 samples from England Central, 2 samples carrying R1b-M269 (xS127), the two of them also carrying DYS393=12. The same goes for France 2 carrying R1b-M269 (xS127) the two also carrying DYS393=12. But it gets even more interesting, out of 8 Swiss (n=33) carrying R1b-M269 (xS127) 6 are carrying the DYS393=12. As far as I know, at least in Northern Spain there weren’t any massive graves or signs of population replacements dating back to 3,000 to 4,000 years ago. Each area shows strong cultural continuity during those times, with strong trade between them and cultural influences always moving (slowly) south to north. Let me say something, because perhaps the only here who is L23+ am I.
Jeanlohizun says: “But it gets even more interesting, out of 8 Swiss (n=33) carrying R1b-M269 (xS127) 6 are carrying the DYS393=12”. The link between Italian L23-s and the Swiss ones is known from so long by us, I’d say not only Swiss persons, but of the Rhine Valley, of the British Isles themselves, for not saying the Ashkenazic Jews who, I think, come from these places. Not only: I found in the past that also the Italian R1b1a2/YCAII=17-23 had some persons till Switzerland and the Rhaetian Region. I have spent some money lately to test an American of Swiss descent (Flickinger/Flückiger) for S136 (my private SNP), because I calculated that we have a MRCA in the first centuries AD. The interesting thing is that these Flickingers come from Weissenburg, the Roman Biriciana, where Roman troops stayed on the “Limes”. We could hypothesize a common Roman-Etruscan origin. The Flickingers haven’t this mutation, nor the Ashkenazic Jews line of Dubinsky, linked to me at the level of the 8th century. Nor have this mutation my cousin’s husband Giorgio Tognarelli, found R1b1a2a/L23+ at 23andme and whom I am testing for 37Y at FTDNA. This for saying that these L23+ come probably from Italy and are linked to me and I think having demonstrated in all these years that Iberia lacks the R1b’s haplogroups upstream R-P312*, and for this I have always supported that Iberia wasn’t the refugium of R1b. This for saying that these L23+ come probably from Italy... and I think having demonstrated in all these years that Iberia lacks the R1b’s haplogroups upstream R-P312*, and for this I have always supported that Iberia wasn’t the refugium of R1b. First of all, not only Iberia, but Europe as a whole has relatively few haplotypes of subclades upstream of P312. Iberia is not an exception. Then, nobody claims, as far as I know, that Iberia was "a refugium of R1b". If you take a look at the ht35 Project, you see that the whole Project contains only 16 haplotypes M269*, 100 of L23*, 15 of L51*, and 25 of L11*. This is a drop in a bucket. Compare with thousands of haplotypes of downstream subclades in other Projects. L23 could not posssibly arose in Italy. Italy was a passing region for R1b1a2 around 5000-4500 ybp which were moving from Asia Minor (5500-6000 ybp) and Middle East (5500-6000 ybp) to Europe. There are plenty of L23 in the Caucasus and Anatolia, all with 6000 ybp. They were moving South and then West, to Europe. L51 had a much better chance to arose in Europe, since it is a downstream of L23. Dear Anatole, I want to say that not only I have nothing against Bashkirs and I wouldn’t consider to come from them like a shame, but that I like Russians too and about you I can say that you are a great scholar in your field and have written also ponderous papers about genetic genealogy and I don’t mind where they were published. You are without any doubt a great worker and have all my respect. I too have written a lot in my field (books of poetry and critics) and about genetic genealogy I have written a lot on those forums that didn’t ban me, above all here on Dienekes’ and Worldfamilies. But in other two forums (not considering others where I wrote less) I had written at least 2500 postings. This for saying that I too have done my researches, and I cannot now to say in a few words all that. The ht35 project was of Vizachero’s, who was my worst enemy and probably the cause of my banishments. Where is he now? Under his plants. If his design has been defeated, something will mean. He was on your line: to demonstrate that R1b1b2 came from Middle East to justify the Middle Eastern origin of many Jews. Now I have demonstrated that many of them are European: R-L4 is above all Tuscan (see 1000 Genomes Projec)t; R-L21, the Baltic cluster of Rich Stevens, derives from a French around 1000AD; Ted Kandell is now searching for his G2c in France; I am more and more convinced that R1b1b2 and R1b1b2a are Italian or Central Mediterranean; about R1b1/V88+ I have discussed for many years with Sam Vass, a friend; I have said many times that neither J1 and J2 are sure, and I don’t want to be pitiless over. I think having demonstrated that R1b1b2/M269 couldn’t be derived from the Eastern R1b1*, presupposing YCAII=18-22 or 18-23, and the Eastern ones have a RecLOH above all 23-23. Not only, but I have written that also R-M335 and R1b1b1 probably arose in Western Europe, and I think above all to Italy. Neither your R1a… is surely Eastern, because R1a-M420 is above all in Europe, Eastern but also Western, including Italy, and I found a plenty of them in the British Isles (presupposed of course: we should test them for this SNP). Eastern R-L23-s are above all Armenians, and Armenians are Indo-Europeans come from the Balkans: they were linked above all to Greeks, and a recent paper on Caucasian peoples, those who live in isolate regions, hasn’t found R1b1b2: if it was expanded from Asia Minor we should have found a plenty of it. What is it wrong in your method, beyond what I have said (mutations around the modal, convergence to the modal as time passes, artifice of a modal itself, etc.)? Then: mutations are much more than it seems, then for a long period this calculation is unreliable. For a short period (in this case I use it too), when mutations are a few and probably mostly of one around the “modal” (but not an abstract modal, but the true values of “that” ancestor), in the cases of 25 markers you spoke above, have you calculated a Mutation Rate for each locus, summed them and divided for the makers taken in consideration to obtain the average MR? As you can see, the variables are too much and are aleatory, like the history of the men, who unfortunately or fortunately aren’t like gases. 1. Jews in their majority are of the Middle Eastern origin, including many those of haplogroups J1, J2, and R1b1a2 (the last one arose in the proto-Jews ~5500 ybp). 2. R1b1 came from Cental Asia. 3. R1b1 came via South Ural and nowadays Kazakstan (hence, the Uygurs, Bashkirs, Kazachs, Tuva people, etc. of R1b1b1 and R1b1a2. 4. From there R1b1a2 (largely as L23) came via the Caucasus, Anatolia, Middle East and then to Europe by a several routes. I can count three: from Black Sea westward, from Asia Minor, and from the Middle East westward along the Mediterranean to Iberia, to arrive there ~4800 ybp. 5. Rib1a2 spoke then a non-IE language(s). They have aquired IE languages not earlier than ~3000 ybp. If it is shown, no problem with that. R-21 is about 4200 years "old", and probably arose in nowadays France (by land) and the Isles (by sea). You can call them as you wish. However, always think where did they come from. For example, I am a Bostonian, but I came from Moscow, Russia (albeit a long time ago, almost as long ago as R1b1a2 came to Italy). 10. R-M335 and R1b1b1 probably arose in Western Europe, and I think above all to Italy. O.K. (Between us, girls - it is incorrect), however, have them all. Let it be a gift. There are plenty of L23 among Georgians, Dagestanis, and many other Caucasus folks. They did not come from Italy, believe me. 12. >What is it wrong in your method... mutations are much more than it seems, then for a long period this calculation is unreliable. It would be nice if you leave calculations for me. I know what I am doing, believe me. Let me remind you - when you measure inches, feet, and miles (for you - sentimeters, meters and kilometers), you do not use the same measuring tape, aren't you? The same way, when I work with timespans of 20,000 ybp and older, I do not use 67 marker haplotypes. I use the slowest 22 marker ones, which you have no idea about. This is O.K., it is not your specialty. It is my professional area. I wrote textbooks about it, namely on reaction rate constants and how to handle them. Mutations in the DNA are reactions after all, they are ruled by mutation rate constants, and I know how to calculate and interpret them. O.K.? I do not need to do it. When I work with chemical reactions, I also do not consider separate molecules, to sum them and divide them. They are all statistical processes. I can tell you about it later. 14. ...like the history of the men, who unfortunately or fortunately aren’t like gases. In a way, they are. It depends on a problem you are trying to solve. If the problem is of a statistical nature, men behave like gases. It might sounds shocking to you, but even beautiful women behave like gases in some (statistical) situations. I think we both have expressed our positions and the victory between them we’ll be decided by the aDNA, like I and everyone of us think, beginning from the Y of Ötzi, an “Italian” of 5300YBP, that will be communicated on next 20-22 October. To illustrate my positions, and as I have said many times that Iberia lacks ancient clades upstream R-P312* (and this is in contrast with your theory of a migration from Middle East to Spain via North Africa) and as Busby’s paper has found two R-M269(x127) amongst Basque, I’ll use my method for these two haplotypes. They belong probably to the same cluster, having single mutations of one around the «modal», the supposed modal of their ancestor. Then probably this Basque R-M269(xS127) isn’t an ancient Basque presence, but entered amongst them in the first centuries AD. If one says that it could continue a more ancient Basque haplotype, I’d say what I said to Jews: show me more ancient haplotypes in the same area. It is little believable that only one has survived. Of course this doesn’t solve the problem of many different introgressions that other peoples may have had, but if like amongst Jews all the ancestors have less than 2000 years, some suspicious may come. Excluded the third, clearly an I-M26, the other are true M269(xS127). Then these haplotypes are present in West Sicily from at least 3600 years. At least, because it is a little bit reliable that the very slow mutating DYS392 has had two mutation for the tangent (from 13 to 12 and from 12 to 11) and other markers faster mutating are on the “modal”. Then this is a case, probably, of many mutations around the modal, and the MRCA of these two haplotypes could be a lot older. "Rib1a2 spoke then a non-IE language(s). They have aquired IE languages not earlier than ~3000 ybp"
The same methods that brought as haplogroup/type age estimates put IE at 8,000+ years ago. Most northern European archeologists agree that Jastorf (~2,600ya) was early Germanic, with the preceding bronze age (starting ~3,800ya) the formative time that made this IE Germanic. Celtic languages are generally assumed to be >3,000 years old and at least spoken to the west of later Germanic regions of about the same time (if not in western culturally Celtic regions). Would you kindly explain why R1b1a2 did not speak IE, when almost everyone else did? It seems that TP03-SIC-W is a “Balkan cluster”, those named “Albanian cluster” by Argiedude. Then: either a Sicilian of Arberesh descent or the witness of the most ancient cluster I linked to Italy. It needs to deepen. Do not bet too much on single aDNAs, Otzi among them. They can be purely accidental. A system is what counts, not singles. Singles might be useful, but they might be very misleading. Why is it "in contrast"? Upstream clades are often rare, due to many reasons. Population bottlenecks, for example. Just think, why L11 in Iberia (or elsewhere) has a dating of 4800 ybp, but its downstream, U106 and P312, have ~4200 and 3700 ybp, respectively? Where those 600-1100 years gone in U106 and P312? The most likely answer: a population bottleneck. Do you have a different explanation? But please not a kind of that they were stolen by extraterrestrials. I do not have any other (justified) hypothesis other than L11 had arrived to Iberia, split U106 and P312, and then almost disappeared for several centuries. That is why there are too few survivers of L11, U106 and P312 (and their descendants) in Iberia. The last two have practically started again from their respective survivors around 4000 ybp. That is fine. So what? They are/or of L23 and L51, if typed correctly. Descendants of those who survived or who came there later. You do not have their "modal", whatever it means. In fact, they two are VERY distant haplotypes. Since the mutation rate constant for those 10 marker haplotype is 0.019 mutations per haplotype per 25 years, these two haplotypes are separated by ~6650 years, IF they belong BOTH to either L23, or L51. If they belong one to L23, another to L51, the difference is much larger. That is why those (xS127) are almost meaningless for quantitative analysis. Anyway, they do not "belong to the same cluster". It is an awful stretch. Then probably this Basque R-M269(xS127) isn’t an ancient Basque presence, but entered amongst them in the first centuries AD. Maybe yes, maybe no. Maybe 10th century, maybe 4800 ybp, maybe anything. Why to guess? It is little believable that only one has survived. One - in the dataset? Or in Iberia? When on Earth did you get THAT? Then this is a case, probably, of many mutations around the modal, and the MRCA of these two haplotypes could be a lot older. I do not understand that, however, I would suggest you to talk on the area of your expertise. You make me suffering, what I read THAT stuff, cited above. Anatole >"Rib1a2 spoke then a non-IE language(s). They have aquired IE languages not earlier than ~3000 ybp"
The first statement is generally correct. "8000+ years" is mainly related to assumed Anatolian proto-IE languages, which supposedly were brought to Europe, and about 6000 ybp IE languages started to split to IE branches. If we are in agreement there, I can continue. If we are in disagreement here, please lay out relevant DATA. The second statement, on dating Celtic languages, is inaccurate. Celts (Kelts) are "fixed" in Europe not earlier the 5th century BC. Their language is attested as an IE language. However, nobody knows which haplogroup those Celts had. However, a number of historians place them as migrants from the Russian steppes from ~ 5 century BC. There were no R1b1a2 in the Russian steppes at ~ 5 century BC. However, there were plenty of R1a1 tribes there, and more than 10 R1a1 branches moved to Europe betweeen 2800 and 2500 BC. Conclusions? Make them yourselves. The third statement, "why R1b1a2 did not speak IE, when almost everyone else did?" - is HIGHLY inaccurate. Who were those "almost everyone"? Have you heard on non-IE languages in Europe? Basques, Ibers, Ligurians, Etruscas, and dozens tribes more? Europe in about 5,000-3,000 mainly spoke non-IE languages. Look it up. It seems that only R1a1 spoke IE languages. Ay any rate, they brought the IE language to India and Iran ~3500 ybp. Give me ANY evidence that R1b1a2 spoke an IE language 3500 ybp or earlier. It would be nice to present here DATA, not "conventional wisdom". Anatole says: “However, nobody knows which haplogroup those Celts had. However, a number of historians place them as migrants from the Russian steppes from ~ 5 century BC. There were no R1b1a2 in the Russian steppes at ~ 5 century BC”. Anatole, you are a friend, but if all your science is like this statement: “Conclusions? Make them yourself”. We all know that as long as there is insufficient aDNA, we can only draw conclusions from the few data points we have, and from archaeology and history. My view is that archaeology and history teach us that after the advent of agriculture in Europe, there was a lot of continuity (with some disruptions and migrations, but those would largely not completely replace populations - even when they changed their language, like in Hungary). The Lichtenstein cave data tell us that three haplogroups from 3,000 years ago are still present locally in the same area. I am firmly convinced that in many places, not much changed in the past 3,000 years. Yes, locally you have e.g. the Slavic expansion - but (at least in my interpretation of the data) the haplogroups involved are only present at the 10% to 20% level in many (non-central) Slavic-speaking regions today (e.g., parts of Poland and the Czech Republic). The other R1a there as in Germany and Scandinavia is "older" and was present before (as also in the Lichtenstein cave). 3,000 years ago, most agree IE was spoken at least from Scandinavia to parts of Italy, and of course in the Balkans and in Greece - not to mention all the areas to the East. What haplotypes did the Celts have? At their inception, given that they lived in Southern Germany, Switzerland, Austria, and surrounding regions, my best guess is: roughly the same that there is now... of course the question of what sub-groups exactly leads to timing questions that are difficult to answer in detail. But my best guess is that R1b1a2 with its sub-groups was a huge portion of it, as it is today, next to some R1a and I. It seems that only R1a1 spoke IE languages. Ay any rate, they brought the IE language to India and Iran ~3500 ybp. I let Dienekes answer that, if he feels like it. >We all know that as long as there is insufficient aDNA, we can only draw conclusions from the few data points we have, and from archaeology and history. Exactly. That is how science works. Scientists ALWAYS make decisions based on frangmentary information. This is why science is always in development, and never ends. To ridicule science in development is just for very insecure and "restricted" people. Let's remember it. When something contradicts "opinions", and at the same times is based on DATA, particularly on new data, it is great. It should be hailed, not ridiculed. Let's remember it as well. Having said that, back to your comments. No problem with that, though "continuity" should be defined here. After millions of Jews were exterminated in Europe, there was continuity there all right. After 30 million Russians were killed in WWII, and before that about 20 million were killed during the Civil War and by the Stalin gangs(CK, NKVD, GPU, MVD, etc) continuity was all right too. Indeed, Europe was never totally empty for the last 10 kya or so, so continuity was all right. However, as you probably know, I1 in Europe had a severe bottleneck around 3400 ybp. Furthermore, as I have already indicated, the same bottleneck for I1 was in Scandinavia at the same time, however, with quite different base haplotypes. I can show here HOW difference are Central European/East European/West European I1 base haplotypes vs. Scandinavian base haplotypes, with the same TMRCA at about 3400 ybp. Are we in agreement with the above? If yes, we can continue. If not, give me your reason why not. >The Lichtenstein cave data tell us that three haplogroups from 3,000 years ago are still present locally in the same area. Please list here the LC haplogroups and tell what is in contradiction with what I am saying here. Look above what dating I gave for I1 haplotypes. If they are NOT in contradiction, why do you even mention it? I am firmly convinced that in many places, not much changed in the past 3,000 years. I am all for it. Does it contradict with ANY of my statements? If not, why did you say it? Does it contradict with that I am saying? What contradicts specifically, if anything? DATA, please. Do not give me that "most agree" stuff. Not so long ago "most agree" in the French Academy that meteorites do not exist, and they "do not fall from the sky". That was the official verdict of the Academy. By the way, 3000 ybp "the Tenths" (R1a1 with DYS388=10) were in North-Western Europe, apparently. Then, when IE language began to split into branches (presumably in Europe) ~6000 ybp, do you "see" R1b1a2 in Europe? Any DATA, maybe? >What haplotypes did the Celts have? ... of course the question of what sub-groups exactly leads to timing questions that are difficult to answer in detail. Be direct - you do not know. It is O.K., nobody knows. I have offered a hypothesis (R1a1) based on their migrations and language. What is wrong with that? If you are really interested in this question, be serious and consider the multitude of DATA. But my best guess is that R1b1a2... with its sub-groups was a huge portion of it, as it is today, next to some R1a and I. Please do not give me guesses. Be systematic and weigh different data. As I did. I am a R-L371+ under M269. The unique STR signature is 448=17, 456=14, 450=10 with 385a=11 or 12. ISOGG will put this newest sub M269 / sub L21 branch on the haplotree within 2 weeks. One think I have learned in my research is that males in this line have a longer lifespan than their generational counterparts over the past 400 years or about 13 to 14 generations. As an example, my father lived 100 years (1890 to 1990). He had a very specific dietary regimen and a unique physically active job. Family documents and family lore held that we follow a specific marriage pattern in our family to preserve our heritage and I guess from what I can see our gene pool. I am seeking to fund academic research in this area and please tell me on this forum if I did so how it would or wouldn't help in answering some of your questions on the bigger pool of M269 males. Please limit your response on this forum to 150 words or less in a single post and include the sample size needed how you would ID and recruit participants to prepare bulletproof research. “Why do I hope having found in Soncina (UBTF9) the possible witness of this hypothetical Italian R-L21? Because he has the very rare DYS19=10. Then he has DYS385=11,14 (the modal before the RecLOH), and other modal markers or quasi-modal, but DYS450=10, against the ubiquitous 8, could be a sign”. My hypothesis is that also R-L21 can be born in the Italian Lake region, having in Argiedude, from Como lake, one of the most ancient haplotype of this haplogroup. This hypothetical R-L21 Soncina is from Garda Lake, and he has the very rare DYS450=10. I don’t know if you know that there, in a little town, has been found a mutation which permit to its owner to live till 100 years. For this I am very interested to your case. I am a R-L371+ under M269. Well, maybe, however, there is no such a cubclase there as yet. However,ISOGG said - "Added ...L371 ...on 21 March 2011". They seemingly did not add it as yet. >I have learned in my research is that males in this line have a longer lifespan than their generational counterparts over the past 400 years or about 13 to 14 generations. Maybe, but it is irrelevant regarding your clade as a whole. Anyway, if you send me the L371 dataset (67 marker haplotypes) I can tell a thing or two about you DNA-relatives. You can find my e-mail address on the net. There are only two persons here who determine the limit of our comments here: the owner of this blog, and the author, in this case myself. You do not have voice in this particular situation. I do not like to teach you good manners, but you beg for it. Anatole, these are two G2a4 we are discussing about because there is a news (not confirmed) that this could be the Ötzi’s haplogroup. I’d be very glad that you could calculate the MRCA of these two Italians of to-day and explain to me how can you decide how many mutations has had every marker without reconstructing intermediate haplotypes, above all for those markers which rotate around two values and rarely go for the tangent like DYS391. These two individuals are separated by 16200 years, if they indeed belong to the same subclade. In this case their common ancestor lived 8100 years ago. Your other questions are trivial in the field of chemical kinetics. Every chemical or biological reaction involves zillions of molecules which jumping back and forth, and it does not bother scientists working in the field. Mutations in haplotypes behave the same way, and it should not bother you at all. This is not your professional field, not a big deal. Anatole, what does it mean that “These two individuals are separated by 16200 years, if they indeed belong to the same subclade. In this case their common ancestor lived 8100 years ago”? They are 16200 or 8100? Is it the history of Adam and Eve, who seemed 150000 and 60000 years old, and now we have seen, after Cruciani above all, that probably also Adam met Eve when she was yet receptive? These two Italians are both L91+, then have a common ancestor, exactly who had this mutation. When one calculates the MRCA, he takes in considerations at least two individuals, and not one by one side and from the other a Platonic Idea, your GOD-MODAL, modal of what? 8100YBP is a good date, in front of the about 4000 years of a traditional old way to date: the double, even though I said that we should have multiply for 2.5 (but DYS19=15 should mean 15-15, then we should add two other mutations to the 38 counted). Now also Ken Nordtvedt is interested to these haplotypes. Let us see what he will draw out.